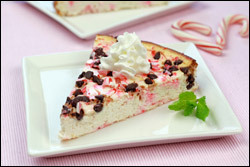 You decorate your house for the holidays -- why not let your DESSERTS get into the holiday spirit too? These new seasonal treats ROCK! Caramel + apple + cookie. What's not to love? Vertically cut each caramel cube in half, and cut each half into 3 evenly sized pieces. In a microwave-safe bowl, sprinkle apple with cinnamon and 1 1/2 tsp. brown sugar, and stir to coat. Microwave for 2 minutes, or until slightly softened. Mix well. In a medium-large bowl, combine Splenda with remaining 1/4 cup brown sugar. Add butter, applesauce, egg substitute, and vanilla extract, and thoroughly whisk. Add flour, baking powder, and salt, and stir until smooth. 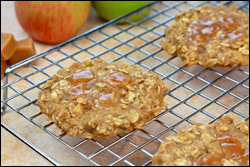 Fold in oats and apple mixture. Place 4 caramel pieces on top of each softie, toward the centers. HG Alternative: Swap out the Splenda for the same amount of granulated white sugar, and each softie will have 155 calories, 29.5g carbs, and 15.5g sugars (PointsPlus® value 4*). Sure, candy canes are typically associated with December holidays... But this criminally delicious cheesecake is worth making TODAY! HG Alternative: Swap out the sugar for the same amount of Splenda No Calorie Sweetener (granulated), and each serving will have 144 calories, 18g carbs, and 12g sugars (PointsPlus® value 4*). Do you know anyone who might enjoy these recipes? Of course you do! Click "Send to a Friend" NOW. Today, November 15th, is America Recycles Day. Ever wondered where exactly to dispose of batteries? Click for a cool tool to help you find the nearest location!